With the creation of the African Foundation, we have thus embarked on a wider enterprise in the service of our continent and its peoples, for we believe that the advancement and promotion of international law, and of the rule of law, are integral to the development of Africa. We also believe that Africa has much to contribute to the development of international law and to the values underlying it for a better understanding and peace among nations. As stated by Chinua Achebe: “Africa is not only a geographical expression; its is also a metaphysical landscape; it is in fact a view of the world and of the whole cosmos perceived from a particular position” (“Thoughts on the African Novel” in Chinua Achebe, Hopes and impediments: Selected Essays, Anchor Books, October 1990, p. 92). A clear articulation of that view with respect to international law will not only be to the benefit of Africa, but of the entire world. It is therefore our hope that through the establishment of the African Foundation, we will have both a strategy and a mechanism for pursuing the above objectives. Unfortunately, the situation has not changed much. In certain cases, it has actually worsened. Suffice it to mention the genocide in Rwanda, the massacres and mass killings in Somalia, Sierra Leone, and Sudan and the conflicts in Côte d’Ivoire and Democratic Republic of Congo. Civil wars, the collapse of state institutions, and the rise of warlords and tin-pot tyrants continue to undermine human rights, the rule of law and the prospects for economic development in certain parts of the continent. It is not however all doom and gloom in Africa, as some may argue. In many African countries, the rule of law is slowly taking root. Continent-wide institutions and initiatives, such as the African Union and NEPAD are also showing a new commitment to the promotion of democratic change, peaceful resolution of conflicts and economic development. The African Foundation will try to contribute to these positive trends in the continent. 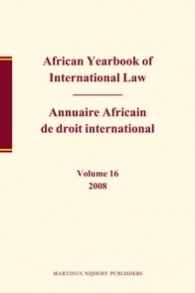 Through the study and analysis of emerging legal issues of particular relevance to Africa, such as the creation of viable continental institutions capable of promoting unity and security for the peoples of the continent, the effective protection of human rights, the end of impunity for mass killings and massive violations of the rule of law, the promotion of a rule-based democratic culture, the role of African countries in a globalizing world economy and in international trade relations, the African Foundation will strive to be responsive to the intellectual needs of African countries in the area of international law, and to the continuing struggle for creating an environment conducive to the rule of law throughout the continent. These challenges will hopefully keep the African Foundation a vital and vibrant institution for the years to come.